Forward Devon Ellis, ‘21, attempts to dribble past a Schaumburg defender. The Cougars lost 45-41 to Schaumburg on Friday. Coming into Friday’s matchup, the Schaumburg Saxons were tied for first in the MSL West with a 5-1 record and an overall record of 15-5. 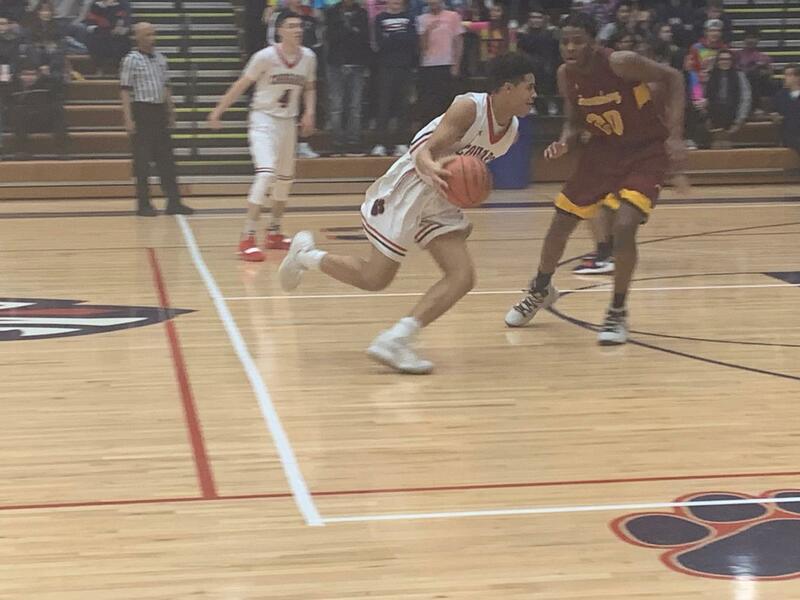 The Saxons continued their strong season on Friday as they beat the Cougars at Conant 45-41. With 20.2 seconds left, the Cougars got the ball back after a missed free throw from Schaumburg guard Heze Trotter, ‘19, down 43-39. It took the Cougars over 15 seconds to get a shot off, during which captain and guard Anthony Wachal, ‘19, was fouled. Wachal made his two free throws, but with only 2.8 seconds left in the game. Forward Raj Mittal, ‘19, was the Cougars’ leading scorer at 13 points. The Cougars lost on Saturday to Saint Patrick 62-44 . The Cougars are now 8-12 on the season, with a 3-4 MSL West record.